C & C was begun in 1997 as a university-wide eﬀort designed to provide assistance and implementation support to unique research and study projects planned by the university’s own undergraduate and graduate students. The program now epitomizes Kyushu University’s unique approach to education. Based on the undergraduate and graduate students’ youthfulness, the research and study projects are one-of-a-kind. Students implement these themselves, which allows for the opportunity to know the joy of creative self-discovery. This program is supported by the Kyushu University Fund. 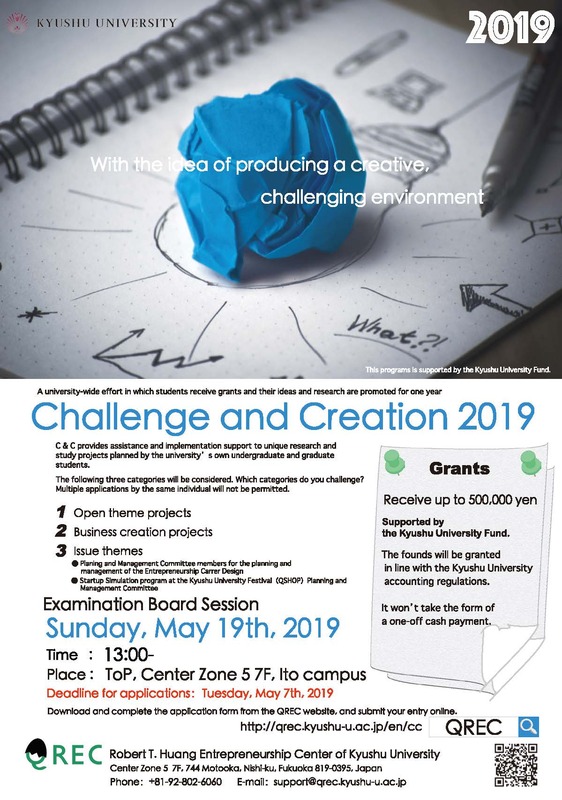 Venue ：Center Zone 5 7F, ToP in Ito Campus. *If a lots of participants, we maybe change start time. The following three categories will be considered. Multiple applications by the same individual will not be permitted. Set the theme of the project yourself in line with your own interests and awareness of issues. It is hoped that there will be research and practical projects that are unique, relevant to society and interdisciplinary, and cover topics such as international exchange, environmental, medical and welfare issues, and regional planning. Why not try to expand your ideas towards turning them into a business or business start-up? The project does not necessarily have to be on a technological theme. A wide range of help will be provided including with external presentations towards realizing your business. III. Issue themesA planning team is put together for each theme. Those interested should refer to the following. C＆C Issue Theme Project I：Startup Simulation program at the Kyushu University Festival（QSHOP）Planning and Management Committee members for the planning and management of the program, Also we call for students to participate in the QSHOP as CEO or others to open shops at Kyudaisai Festival. C＆C Issue Theme Project II：Planning and Management Committee members for the planning and management of the Entrepreneurship Career Design. Kyushu University. The plan must be your original idea. It does not have to be from your feeld. ・Graduation theses and master’s theses will not be eligible for screening. Each proposal is planned to receive up to 500,000 yen（scheduled）. ・The funds will be granted in line with the Kyushu University accounting regulations. It will not take the form of a one-off cash payment. Download and complete the application form and submit it ‘REGISTER NOW’. ●Presentations are required by each project. ●Group data must be submitted. ●Required to attend the examination board session. * Presentations are required by each project. * A ‘Best Award’ will be given to the project team that achieves the most outstanding results. * Group data must be submitted.